Perhaps it’s no coincidence that the winner of the NBJ Large Company Growth Award this year is GT’s Kombucha, and the winner of the NBJ Medium Company Growth Award this year is Ganeden. Kombucha has a healthy halo about it as a fermented beverage packed with beneficial bacteria. The leading kombucha brand in America also adds an efficacious dose of GanedenBC30 probiotic strain. There’s a reason probiotics are the star of the nutritional market today. Like most functional foods, it helps to have nutritional ingredients integrated into foods and beverage products that already share some benefits—added beta-glucans into oatmeal, for example, or protein into dairy products. Or, as is the case here, probiotics into the naturally probiotic fermented beverage kombucha. Probiotics are an easy fit in almost anything. The core strategy of Ganeden is to get consumers to consume more probiotics—all without changing their lifestyle habits. That means putting probiotics wherever any healthy product meets a shopper. Claims can be made because of Ganeden’s commitment to published research—the company is up to 25 clinicals on GanedenBC30. 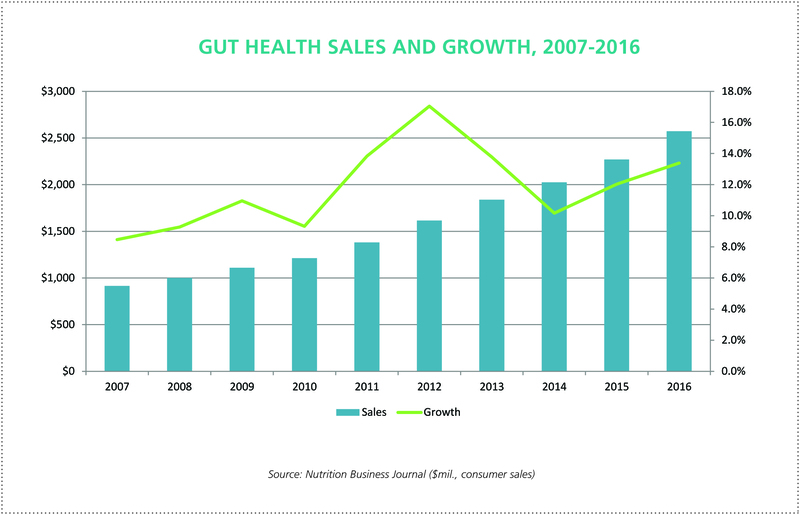 If clients formulate with 500 million CFUs of GanedenBC30, they can use an immune health claim, while 1 billion CFUs will net an additional digestive health and protein utilization claim (a dozen of its most recent research studies support the latter). At the 2016 Natural Products Expo West, Ganeden showcased 60 new products that launched with the GanedenBC30 probiotic strain. In 2017’s show, Ganeden boasted 125 such products. That’s just from the holiday season through early March. The company is doubling in size every two years, including over 50 percent sales growth last year. Perhaps the most remarkable thing about Ganeden’s growth is that the company started out as a finished product supplement company selling probiotic capsules, tablets and gummies. Then, in 2006, the company hired Bush as a consultant. At the time, the flagship GanedenBC30 was in its Digestive Advantage and Sustenex SKUs, sold in 65,000 food/drug/mass stores. Bush saw opportunity elsewhere. 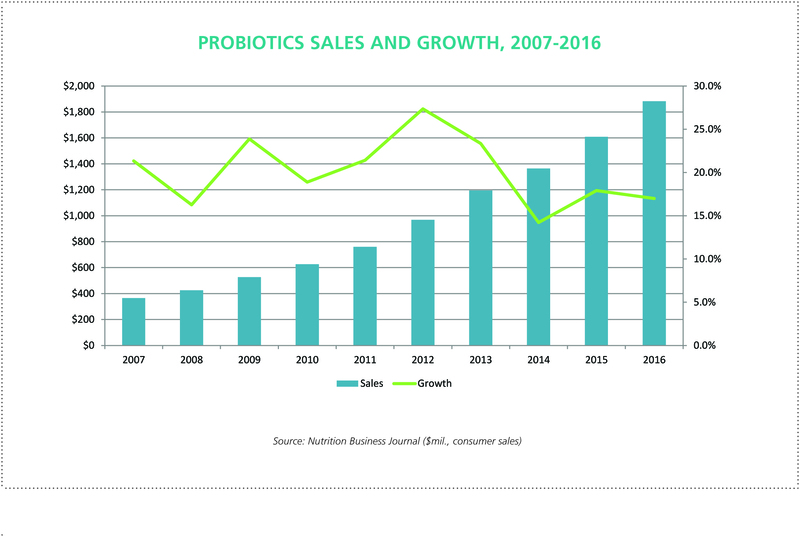 Despite the appearance of success as a supplement brand, there could be greater opportunity as a licensing business, in particular given the hardy nature of its spore-forming probiotic strain. So the company sold its supplement business in 2011 to Schiff (which later sold it to Reckitt Benckiser). “We had this established team getting pills and tablets out the door every day,” Bush says. “There was this back hallway where me, Joe and Julia were working away.” The trio was doing something completely different from the rest of the company, which was selling nine SKUs into the likes of CVS, Walmart, Safeway and Kroger. Yet there was a problem. Bush says that Harvard University students wrote a case study on Ganeden and its shift from being a direct consumer model to being a licensing model. While the company continues to churn out research (roughly four to six new studies each year), it also claims an impressive intellectual property dossier, with 135 issued patents. One such example is an exclusive on using Bacillus coagulans probiotic strains for coffee, tea and cereal. So if you’re a coffee or tea maker and want to put Bacillus coagulans in it, you have to either source Ganeden’s or pay them a royalty fee—an area that is a growing revenue source for the company. Ganeden’s elevator pitch is that they are a company that can help brands innovate in the probiotics space with a shelf-stable strain with solid claims backed by science. “We’re not an ingredient supplier. We sell and license our ingredient,” says Bush. “When we sell to anybody, they get, in the price of the material, a license to use our logo, our relevant IP, our clinical studies. We help with marketing. We’re editing press releases for our customers. We have a full-time graphic designer for mock-up packaging. We have a style guide. We spell out the claims clients can use at certain CFU levels. Then we test all products to make sure they’re doing that.” The more products those companies sell, the more ingredients Ganeden sells. “We’re a partner,” says Bush. The company continues to innovate. One growing area is with animals. Companion animal food and treat marketers want probiotics. The livestock business, too, is ripe for probiotics. Producers are looking to reduce the amount of antibiotics in their operations, and the wellness claim is attractive. Other areas come from Ganeden’s research program, which includes the simple yet painstaking concept of tinkering with the Bacillus coagulans bacteria. A five-year effort looked at metabolites produced during the fermentation process that creates GanedenBC30. Normally, the solids are kept, and the liquid is discarded. So the company looked into the liquid and discovered lactic acid and other metabolic byproducts, which can have effects on wrinkles and fine lines when used topically. The branded ingredient, Bonicel, was born. A more recent discovery, four years in the making, came from examining the cellular composition of the strain. The immune-health benefit of the probiotic comes from the cell walls of the bacteria. The advantage here is that “inactivated” cells not only still confer a health benefit (though they are not technically a probiotic) but can now be used in shelf-stable beverages and for products that need no refrigeration. “We had a very soft launch at Expo West this year,” says Bush, “and the interest was crazy high.” The branded ingredient, Staimune, was born. Ganeden is a company doing more than riding the probiotic wave. It is shaping that wave, thanks to its hardy bacterial strain that gives it entrée to products run-of-the-mill strains can’t cope with. It also helps that the company is dedicated to a continuous research effort that continues to open up new product and claims opportunities. Its IP dossier is formidable, and that also contributes to growth. But while all these things add up to success, the biggest contributor may well be the one item that can’t be quantified on a P&L statement for an ingredient company: vision.